Hello it’s Friday and time for Friends with Flair. 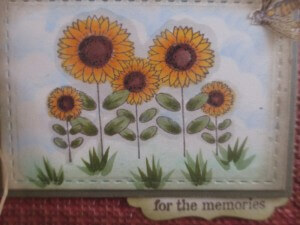 Today’s card is a beautiful sunflower scene , this stamp came in a grab bag from Unity ( love those bags lots of surprises ). and grounded my stamp by adding clumps of grass and a light chalk shading of green , this was then embossed with the stitched mats and a layer added under , I tied a bow with raffia and made flowers with brown stickles center , the bee is from a SU set called Nature Walk and i added glossy accents to his wing to make them pop , It’s hard to see these detail thru the camera but in person its beautiful , the sentiment is Unity and was punch with a SU decorative label punch.I love to create and today was more a fall looking card but I really love sunflowers ( they make me smile ) so I had to use this stamp when I came across it. Hope you have a great weekend and I hope you come back to visit my 8UpScrapin world next week. Wow! What a fun stamp to get in a grab bag! 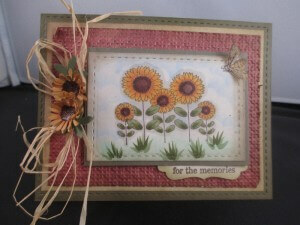 Love all the layers in this card, and the 3D flowers that imitate the stamped image. Very nice! 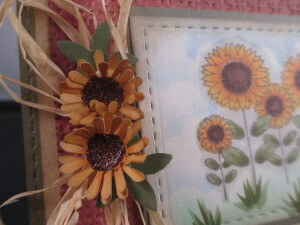 Sunflowers are my favourite flower. Love your card. 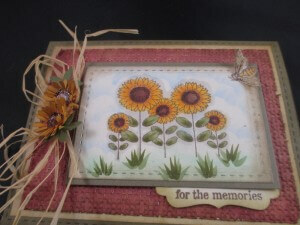 Oh I love sunflowers and your card is just gorgeous! 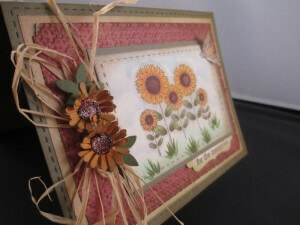 Stunning homegrown card…love everything you have done Crystal!! oh i have this stamp too. Thanks for the inspiration! Love the sunflowers. Your embellishments on this card, are super amazing! Lovely creation! 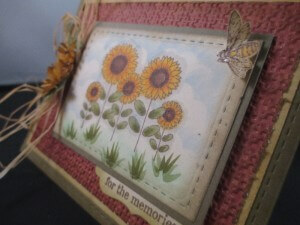 I like sunflowers too and what a terrific job you did with them for this card. So pretty! Your coloring is gorgeous! The raffia fits the card, very country. Your little grass clumps are AWE-SOME. Beautiful card! Awesome coloring on the flowers.